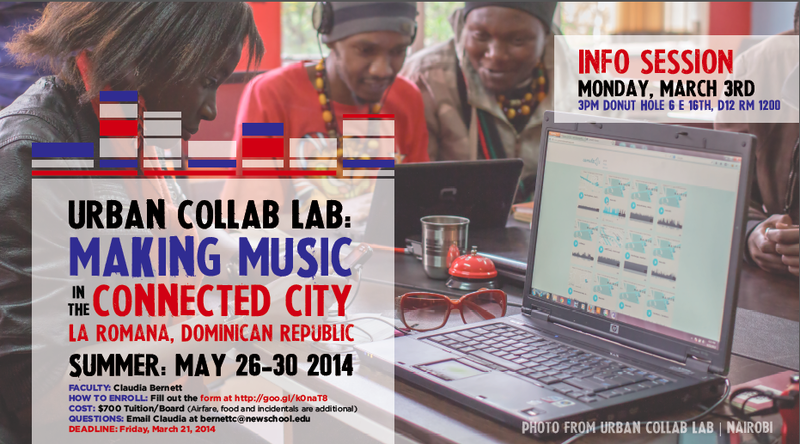 Join us in the Dominican for an amazing week-long music, mobile technology, & culture workshop! It’s going to be an amazing week down in La Romana (at the Parsons-affiliated design school, Altos De Chavon) focused on music, mobile phones, culture, and creative collaboration. We’ll collaborate with local students, artists, musicians and DJs, and end the week with an amazing exhibition and party. This workshop runs the week of May 26th and is worth 1 graduate or undergraduate class credit. See below for more info about the workshop and how to sign-up! The Urban Collab Lab: Making Music in the Connected City | DR brings together students from Parsons and across The New School with students from Altos de Chavon to explore the role of technology in supporting new forms of creative collaboration across economic, cultural, and geographic boundaries. It also seeks to understand how music emerges and evolves in a connected world where there are more phones than people. How do music and sound technologies and the mobile phone change the way we make music and collaborate? What can this tell us about ourselves and our cities? How can we create platforms that forge intersections where few previously existed? This collaboration lab invites participants to first collect or record sound via field recorders & mobile phones and then come together for collaborative music composition, idea development, critical reflection, and presentation. Guest critics and artists may include local DJs and musicians. If you are interested, you must fill out our Google Form by Friday, March 21st. And join us for the info session!